Science entwines with matters of the human heart as a whale researcher chronicles the lives of an endangered family of orcas. A question we all eventually face is whether we have the courage to love someone or something when we know we are going to lose them. In Eva Saulitis’s case, her answer is a resounding yes. At twenty-three, as an idealistic college graduate, Saulitis drove to Alaska to work in a remote salmon hatchery. There, on a winter day, she saw her first orca. Over the next twenty years, as she found her footing as a biologist, she was drawn deeply into the lives of a unique and endangered orca population struggling to survive in Prince William Sound. She came to know and love the whales as a culture and as individuals. In 1989, she witnessed first-hand the devastation wrought by the Exxon Valdez oil spill—after which not a single calf was born to the group. With the intellectual rigor of a scientist and the heart of a poet, Saulitis portrays the whales’ secretive lives, as well as the abundant life of the waters—the birds, seals, and otters with whom the orcas share their world. Vividly she depicts the whales’ personalities, from the matriarch Chenega and her companions to the trio of mischievous “Bad Boys” and the majestic Eyak, who sang like a siren. In the wake of the recent BP oil spill, we still don’t know what the long-term effects on marine life might be. From the vantage of over twenty years dealing with the aftermath of the Valdez spill, Saulitis shows how a group of shy orcas carrying out their lives in a remote corner of Alaska have something to teach us about our connectedness to animals and to place—and what we stand to lose if we don’t protect both. 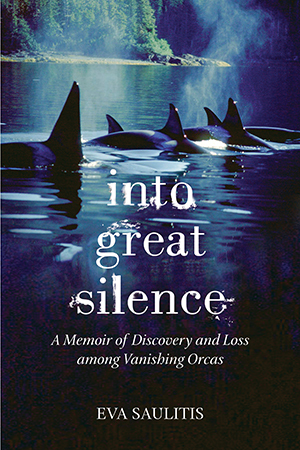 Both an elegy for one orca family and a celebration of a species, Into Great Silence speaks for all vanishing species in an increasingly vulnerable natural world. Like the others the last one fell into its shadow. It fell into its shadow on the water. They took it away its shadow stayed on the water. Before I knew there was such thing as a species, much less one that was endangered, I understood extinction. When I was nine years old, I understood extinction not with my mind, but with my heart. Aptly, I received this instruction not at school, but after, on an ABC After School Special called The Last of the Curlews, based on a novel by Fred Bodsworth. I don’t remember the film’s plot. Only that at some point, there was one pair of curlews left. I vaguely remember a father and son who debated whether or not to shoot a curlew. I recall with clarity the last one, the last Eskimo curlew on earth, circling and calling above the tundra. In the bird’s own memory, I imagined a sky darkened and drummed to life by bodies, wings and the tr tr tr-ing of flight-song, an era when it migrated between the Canadian Arctic and Patagonia with millions of other Eskimo curlews. I can still summon my ache for that last curlew; almost 40 years later, it throbs in my chest. When I was 23, I saw my first orca, a lone female. That day, I had no inkling that I would study her kin for my entire adult life, that she was already one of the last ones. Fresh out of college, I’d taken a job at a fish hatchery in Prince William Sound, Alaska. One blustery winter day, out for a skiff ride, I spotted a black fin amid gray waves. A few minutes later, a whoosh near the skiff startled me. I turned to see a wind-flattened blow, the fin rising, the arch of a flank emerging and sliding back under the water. Then she disappeared, as if the rough sea had swallowed her. I looked everywhere, but she was gone. Twenty-five years later, I’m still searching for that whale, for what’s left of her family. For me, watching the Last of the Curlews was what Susan Cerulean calls an “origin moment.” That day, when I realized human beings could eliminate a kind of bird from the earth, my assumptions about the world overturned. A lifetime of origin moments leads to this one. It’s September, 2011. I sit on our research boat, Natoa, scanning a familiar shoreline for orca blows. The tide is low. A raft of sea otters rests near Squire Point. For many seasons, I followed small groups of orcas called Chugach transients past this point as they hunted for harbor seals. Sometimes, harbor seals hauled out on Squire Point to rest, or hunkered in the shallows alongside the rock to hide from passing orcas. Though I see no seals sprawled on the rock today, I know orcas might appear at any moment. They are like that, unpredictable in their appearances and disappearances. And so are stories we tell about them. Take today. As we idle along the point, Craig, my partner in research and in life, recalls that 35 years ago, with a cadre of volunteer observers on the bluff top on Squire Island, he watched Chugach transients swim along this shoreline. A young field assistant, eye pressed to the lens of a spotting scope, shouted: “Look, the orcas are playing with a porpoise!” That evening, after hiking back down from the bluff to their tents on a beach we still call Whale Camp, they found the severed lungs, heart and head of a porpoise calf washed up on shore. “I tried to preserve the skull, but the porpoise was so young, the bones just fell apart,” Craig says. With Craig, I’ve studied orcas for 25 years, nearly half my life, and I’ve never heard that story before. What I know, after all this time, about the whale called orca, arlluk, aglu, blackfish, killer whale ¬± is a lot like that. Last summer, from an unexpected angle, I got closer to understanding the concept when I edged up to ¬± no, was shoved toward ¬± the possibility of my own extinction. From a sick-bed, my laptop open on my lap, cell phone on the coverlet beside me, I followed the movements of Chenega, one of the last Chugach transient matriarchs, on a computer screen. I stared as a digitized map of Prince William Sound drew itself, then displayed the points and lines of her night-time travels. There. Off Point Helen. I clicked on the biggest dot, the most recent satellite hit. 4:30 am, heading south. The dots told me only that much. Not if she traveled alone. She’d been with her companions, Iktua and Mike, when Craig had tagged her the night before. A sea-breeze drug my eyes across the carpet, the couch, the coffee table piled with get-well cards to a window. There, my eyes met not the Pacific, but the Atlantic; not Prince William Sound, but Cape Cod Bay, where wind left white claw marks on the indigo surface. For the first time in 24 years, I was not in Prince William Sound studying orcas in summer. I clicked on the link to the Iridium website, typed a satellite text-message to Craig and our friend Cy, who was filling in for me on the boat. How Craig had tagged, easily, with one shot, one of the last seven Chugach transients. That was why, from thousands of miles and a continent away, I could call her up each morning and see where she was. That’s how I could track an animal that exemplified fidelity to place, fidelity against all odds, in sickness and in health, in peace and calamity. I’d been told by healers to visualize my immune system preying on cancer cells. I’d been told visualization could lessen chemotherapy’s side-effects and speed up healing. So I visualized. The animals, the place. I visualized kayaking into Sanctuary Bay, where Chenega, Mike and Iktua milled, waiting. I drifted into their midst and placed my hand on Chenega’s fin, placed my hand on the cold, rubbery skin, knowing hot, oxygen-rich blood flowed inside, and I imagined her red and white blood cells traveling up my arm, infusing my own blood with power. The next time Craig called, he told me he’d photographed all of the remaining seven Chugach transients: Chenega, Iktua, Egagutak, Mike, Marie, Ewan, Paddy. All that hot, humid summer, I sat at a desk each day I was able, or I sat with the laptop propped open on my lap in bed, and I wrote their stories. In doing so I understood, not just with my head, not just with my heart, but with my body, that certain places on this earth have healing power, and that the place where the Chugach transients live is one. I came to believe that the place and the whales played a part in rescuing me. Not in some mystical sense, but simply by existing, with or without me. They saved me, though I can’t save them. Now a year has passed. I’m back in Prince William Sound, back on Natoa, short-haired, body altered, a strange, new post-chemo ringing in my ears, one I hear only when it’s quiet. But as always in August, my fingertips are blueberry-stained. As always, resident orcas appear in the passages to feed on silver salmon. As always, salmon spawn and die by the millions in streams. Craig douses bucketfuls of saltwater over four silver salmon he’s caught off Whale Camp beach. As always, we search the shorelines for Chugach transients. Now the tide’s risen and swallowed all but one of the Squire Point rocks. Now a pelagic cormorant and three glaucous-winged gulls cluster on that shrinking, kelp-skirted surface. A front’s pulled a gray blanket over the Sound. I scan with binoculars the choppy water in front of familiar landmarks ¬± Pleiades, Icy Bay, Iktua Passage, Brandt Island, Labyrinth ¬± for a black fin that might, at any moment, appear amid those waves.